"What cause the problem is because it's two different powers. Right? None of them have power, power belong to His Majesty, who is God. What they must do now is acknowledge the truth and no say it's God's ways for running everywhere and deal with it in that way. It can't be done in a different way because, even if a man fight with him outside, he won't fight the next time again. So it better be the last Armageddon. This is the Armageddon. Because consciousness... Every man must fight for consciousness this trip." It's hard to believe that Bob Marly has been dead for more than 20 years because, in some ways, his message of universal peace is as strong now as it ever was. Known as the Third World's first superstar, it is not surprising to see the release on DVD of every scrap of video recorded of this enigmatic and popular musical star. Bob Marley: The Legend Live updates a VHS release of the final recorded performance of Bob Marley and The Wailers, which came on November 25, 1979. In addition to the original 70-minute cut of the concert, the DVD includes seven additional songs. Eschewing many of the trappings of the typical concert video, this show focuses on presenting The Wailers in their element as a performance band. In 1979 Marley was riding the crest of an astonishing wave of worldwide popularity that saw reggae emerge as the leading force of what would come to be called "world music." In 1974, Eric Claption had released a recording of Marley's I Shot the Sheriff that went to number one on the American charts. Assassination attempts, marijuana use, and a highly charged political climate all contributed to the unique quality of Marley's popularity around the globe. Bob Marley: Live in Concert from 1980, which was released in 2002, has been one of the most requested on dOc despite the fact that it has since gone out of print and is not available from any of the normal channels. Although less exotic than when it first emerged in the 1980s, Rastafarianism is a difficult religion to understand from the outside, even though it stands at the heart of Marley's music. However, it is part of his outstanding ability that the songs can be enjoyed in a full and satisfying extent without knowledge of the religion, or of Marcus Garvey, Haile Selassie, or Ethiopia. One will not necessarily gain much of an understanding of the religion from the music or even from Marley's speeches, but there is a feeling for it that accentuates the potency of the songs. The performance here is Bob Marley and the Wailers at the top of their game, performing some of their greatest hits and some more obscure songs. Seeming to be more of a document of a performance rather than something that was meant to be a released film or television special, the show has a "caught on tape" quality that adds to its interest. The second half is particularly potent as the band steps up a notch and Marley seems especially into the emotional quality of the songs. The message of Bob Marley's music is as important today as it was when world music first began to make a global impact. Tolerance, freedom, love, and respect are the themes that continue to resonate with fans around the world, even after so many years. This is a great disc to put on for a young person to see such a charismatic and important performer with so much to say. Image Transfer Review: Bob Marley: The Legend Live appears in an anamporphic widescreen format and the video has been remastered for this release, gaining in detail and clarity. However, despite that, there is a still a slight grainy quality that lingers from the original source. It is possible that this footage was never meant for general release and serves as more of a document of performance with lesser video equipment. There are some inconsistencies in quality between songs, which is probably also traceable back to the source. Overall, this is still a very good transfer. Audio Transfer Review: Audio quality has been enhanced by reprocessing into Dolby Digital 5.1 sound and stereo. Both the highs of the horns and the lows of the persistent bass have benefited, although the surround is mostly noise to add "depth" to the sound. The 5.1 was quite sufficient when played loud and the regular stereo responded well in a more intimate setting. This is a very listenable disc. Extras Review: A very nice selection of extras accompany this concert disc. Historical information is provided about the final tour of Bob Marley and The Wailers and a cultural and historical perspective of Rastafarianism and Marley's music are found in the featurettes and documentary. Chris Salewicz: Video Overview (4m:12s): Author Salewicz provides some historical context for the concert recording presented on the disc. Prophecies and Messages (51m:08s): A nicely constructed documentary that covers Marley's history and biography. Also included are examinations of the politics and faith of Rastafarianism. Copious performance clips round out a solid look at an international phenomenon. The Fans: A Point of View (4m:52s): Chris Salewicz returns to describe Bob Marley playing a benefit for the Sugar Ray Robinson Foundation. The opinions of Marley fans are presented. Bonus Track (6m:06s): A medley of the songs War and Trouble No More is presented and provides a compelling souvenir of one. 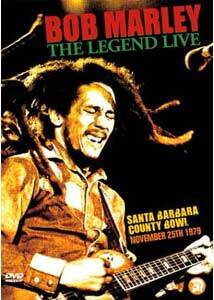 Bob Marley: The Legend Live is definitely a "must-have" video for fans of Bob Marley and the Wailers. Besides being a document of one of the last performances by the reggae legend, it is a scintillating exemplar of the genre.